The Washington Post reports that investigators arrested three people believed to be in connection with a huge fire that began Thursday underneath a portion of Interstate 85 in Atlanta, which later collapsed. While no injuries were reported, the Post reports that repairs will cost $10 million in federal funding. 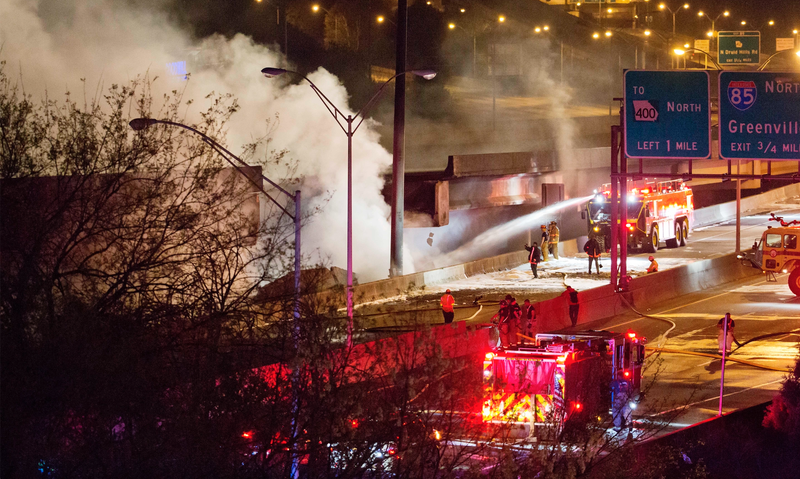 The fire began during rush hour and traffic shut down quickly after due to the deteriorated stability of the overpass. The chunk of interstate that collapsed reportedly put out much of the flame, and foam-spraying firetrucks from the airport, which are meant to deal with plane crashes and fuel fires, arrived on scene later. At the time, it was unclear how the fire started. Both directions of I-85 shut down after the fire started, backing up traffic in nightmarish proportions. The Post reports that 700 feet of road on the overpass was damaged and is in need of replacement after the fire. Investigators spoke with the suspects on Friday night, but have not released more details on what the trio was doing before the fire broke out. Investigators believe Eleby set the fire, which quickly grew out of control as the flames consumed PVC pipes that had been stored under the elevated highway for more than a decade. The Post reports that Eleby has 19 arrests on record, mostly for drug offenses. Stafford told the Post that passerby originally thought the smoke was from a car fire, but firefighters realized that there was a bigger problem upon arriving on scene—they couldn’t get close enough to hose down the “50-foot wall of fire,” Stafford said. A press release from the Georgia Department of Transportation said work began this weekend to repair the two 350-foot sections of road that either collapsed or were damaged during the fire. The release says demolition has begun, and that a new road configuration for those who regularly travel on I-85 will be ready by Monday morning. The new route will “remain in place for the near future” while work continues on I-85.